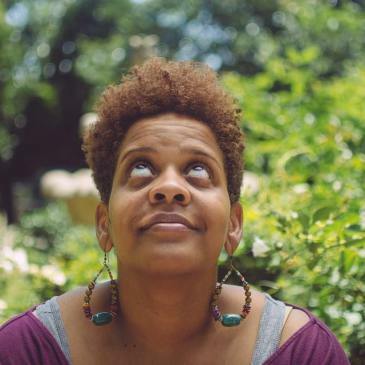 Stacey Rose is a playwright and a graduate of NYU's Department of Dramatic Writing. In this self-care interview, she shares some of her obstacles to recovery and her perspective on the Black movement in America at this time. I was severely asthmatic as a kid. I could watch people run on television and get an attack. I was always at the hospital. That shifted me into an isolating phase where I read a lot and watched television, but I never thought about writing seriously until I was around 30. In my late-20's, I got married. It was a very tumultuous deal, but in the middle of all that he did help me rediscover my love for reading and writing. He always encouraged me to write. I ended up going back to undergrad again for a second degree in theater and fell into playwriting organically. Again, what was confounding for me was that I was the only Black person in my class. When I got in, I went to as many departments as possible, looking for Black people. Did being an "other" also affect how people understood your work, which predominantly focused on the Black identity? It did. By the time I started my thesis, however, I knew what kind of notes I should take. If it wasn't about the direction I was headed, I let it pass. If you're different in any way, nobody else in the room can tell you how that is. They might mean well, but it's not their walk. Tisch taught me a lot about evaluating work. What's the hardest part about self-care for you? I am six years clean and in recovery. Getting clean was the foundation of how I stayed sane over the course of grad school. Why did you become sober? My life was crap. You hit bottom and either you get it together or you die. I was pretty certain I would kill myself if I didn't stop drinking. I got sober on Nov. 10 of 2009 and things just escalated in terms of writing. If you're a recovery baby, your addiction immediately shifts to something else. Mine was theater. What has helped you stay sober? Meetings and step work. I've struggled in recovery; it's not a happily ever after at all. I still struggle with going to meetings, but I maintain a spiritual practice. Right now I'm revisiting Step 1, which is admitting powerlessness. Knowing how vibrant you are, some might be surprised to hear all of your struggles. I had to work to get here. Everybody has their own emotional pain tolerance. I think a lot of my tolerance comes from my mom. "It's one degree outside, the car won't start, but I'm getting on the bus and going to work." I come from a lot of women who just don't stop. The overthinking didn't stop your family. My great-great-grandmother sharecropped after her husband died at 36. She had eight kids, so she just did it. There's this strength that's instilled from my family, so sometimes it's not even a person's fault if they can't push past something. Did you grow up in a religious or spiritual family? My grandmother was an Evangelist/Baptist, but we just went to church on Easter. I don't know where my interest in Buddhism came from, but it happened. When I found it I was so relieved at how open it was and how much room it made for everything. When I began my recovery, I had no idea how I felt about God, but programs are instilled with this process of helping you find whatever it is you believe. Do you feel art should be in tandem with advocacy? Having money and being a person of color means that you need to do something. Waking up Black or Asian or Native American everyday carry its own set of baggage that, in theory, is political. The world needs to open up to the fact that there are more stories than white stories. What is nice about this time is the definition of being Black is shifting and coming into its own. This country owes black people so much, the debt is bottomless. We are not like other minorities in this country, but there's nothing special about what they did to Black Americans. Because of that relationship, there is a blood knot with America and with Black people. This country doesn't know how to atone. It doesn't know what to do with us. They want to tell us to get over it but they can't. I love Black people from top to bottom, from the most ignorant to the most intelligent. I want us to stop apologizing for who we are. We have to take responsibility for every Black person that screw up, but I don't see white people apologizing for Donald Trump. I'm reading a book now about the domestic slave trade called The American Slave Coast: A History of the Slave Breeding Industry. The heart of that movement was in Virginia. They were basically breeding human beings for sale and Thomas Jefferson was at the head of this. The South folded because most of their wealth was in human flesh, so they had no tangible wealth once slavery was abolished. What would you say or do for another artist who's going through struggles you relate to? Another recovery saying--if you're going through hell, keep going. Eventually it ends, and then it comes back. There's no straight line to success so you have to define what success is for yourself. Once you reach that goal, you will have to figure out what success is again. There's a book and program called the 12-Step Buddhist. It's about this guy who incorporates three things into his recovery process. It's Buddhism, recovery meetings and steps, and therapy. I took that to heart. These are the three things that keep me sane. To read the full interview, check out Self-Care With Writers.